So far in this module we have discussed all the important Option Greeks and their applications. It is now time to understand how to calculate these Greeks using the Black & Scholes (BS) Options pricing calculator. The BS options pricing calculator is based on the Black and Scholes options pricing model, which was first published by Fisher Black and Myron Scholes (hence the name Black & Scholes) in 1973, however Robert C Merton developed the model and brought in a full mathematical understanding to the pricing formula. 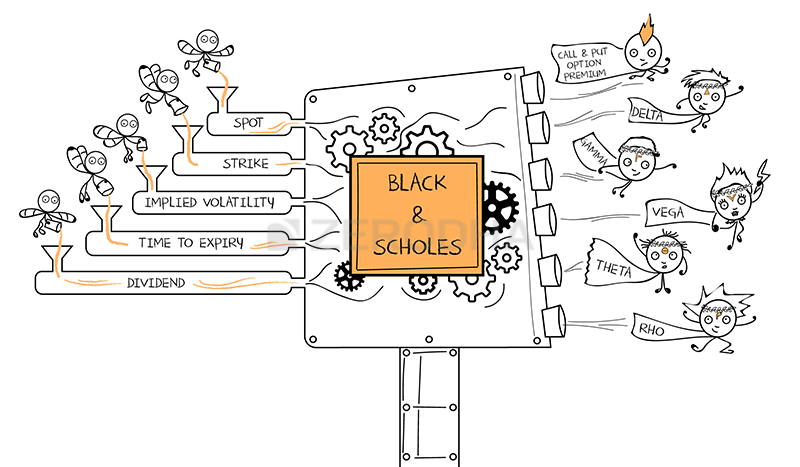 My objective is to take you through the practical application of the Black & Scholes options pricing formula. Think of the BS calculator as a black box, which takes in a bunch of inputs and gives out a bunch of outputs. The inputs required are mostly market data of the options contract and the outputs are the Option Greeks. Spot price – This is the spot price at which the underlying is trading. Note we can even replace the spot price with the futures price. We use the futures price when the option contract is based on futures as its underlying. Usually the commodity and in some cases the currency options are based on futures. For equity option contacts always use the spot price. Interest Rate – This is risk free rate prevailing in the economy. Use the RBI 91 day Treasury bill rate for this purpose. You can get the rate from the RBI website, RBI has made it available on their landing page, as highlighted below. As of September 2015 the prevailing rate is 7.4769% per annum. Dividend – This is the dividend per share expected in the stock, provided the stock goes ex dividend within the expiry period. For example, assume today is 11th September and you wish to calculate the Option Greeks for the ICICI Bank option contract. Assume ICICI Bank is going ex dividend on 18th Sept with a dividend of Rs.4. The expiry for the September series is 24th September 2015, hence the dividend would be Rs.4. in this case. Volatility – This is where you need to enter the option’s implied volatility. You can always look at the option chain provided by NSE to extract the implied volatility data. 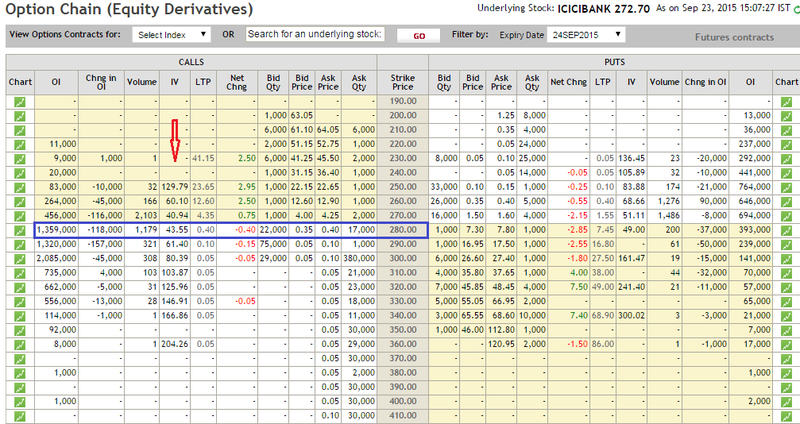 For example, here is the snap shot of ICICI Bank’s 280 CE, and as we can see, the IV for this contract is 43.55%. Let us use this information to calculate the option Greeks for ICICI 280 CE. Once we have this information, we need to feed this into a standard Black & Scholes Options calculator. We do have this calculator on our website – https://zerodha.com/tools/black-scholes , you can use the same to calculate the Greeks. Below the premium values, all the Options Greeks are listed. I’m assuming that by now you are fairly familiar with what each of the Greeks convey, and the application of the same. One last note on option calculators – the option calculator is mainly used to calculate the Option Greeks and the theoretical option price. Sometimes small difference arises owing to variations in input assumptions. Hence for this reason, it is good to have room for the inevitable modeling errors. However by and large, the option calculator is fairly accurate. Put Value + Spot Price = Present value of strike (invested to maturity) + Call Value. For people who are not familiar with the concept of Present value, I would suggest you read through this – http://zerodha.com/varsity/chapter/dcf-primer/ (section 14.3). So why should the equality hold? To help you understand this better think about two traders, Trader A and Trader B. Assume upon expiry Infosys expires at 1100, what do you think happens? Trader A’s Put option becomes profitable and he makes Rs.100 however he loses 100 on the stock that he holds, hence his net pay off is 100 + 1100 = 1200. Trader B’s Call option becomes worthless, hence the option’s value goes to 0, however he has cash equivalent to 1200, hence his account value is 0 + 1200 = 1200. Let’s take another example, assume Infy hits 1350 upon expiry, lets see what happens to the accounts of both the trader’s. So clearly, irrespective of where the stock expires, the equations hold true, meaning both trader A and trader B end up making the same amount of money. All good, but how would you use the PCP to develop a trading strategy? Well, for that you will have to wait for the next module which is dedicated to “Option Strategies” J. Before we start the next module on Option Strategies, we have 2 more chapters to go in this module. The put call parity states that the payoff from a put option plus the spot equals the payoff from call option plus the strike. When can we expect Option Strategies Module..? Very soon, another 2 chapters in the current module and we move to Options Strategies. I notice that the delta of 280 PE is -0.873. But, only deep ITM have such high deltas, right? Where did you get this value from Ajay?. Delta should be less than -0.5. Next chapter (22) will be uploaded next week Ajay. Well, the number of days is treated on something called as the ‘day count convention’…NSE adopts a day count convention called as ‘actual by actual’ according to which you need to take 365 days. Hi In the black scholes option calculator the input for IV is one but the theoretical prices for both put and call are computed based on that one IV INPUT Whereas in reality the IV puts and call for the same strike differ, so using which IV can be better? Can we use the VIX % instead? Vix is a good approximation for Nifty. For stock specific IV check the stock’s option chain for IV. I believe the BS formula if fed with standard deviation of log returns would give provide (predict) option price which may differ slightly form the actual price that is settled in market. Sunil, yes I’m aware of that. In fact check this http://zerodha.com/z-connect/queries/stock-and-fo-queries/option-greeks/how-to-use-the-option-calculator . From what I’ve noticed people tend to get confused with reverse engineering BS model to calculate IV’s, so we decided not do it with the our version of BS calculator. We are trying to keep this very simple and intuitive. We have learned so far that when you buy ATM options , delta is in the region of 0.5-0.6 and as the trade goes in favor , delta increases and therefore for every 1/- move on the stock/index, we get higher (>0.6 ) move on the option…………I want to understand the opposite side….. When i buy ATM options and the positions go against me on the same day, i am assuming that delta will reduce and i will lose less than 0.5 or 0.6 pts in relation to a 1 pt move against me…..Let me explain with an example….Suppose i go long on 7900 CE when nifty breaks through 7940 and then i decide to keep a 40 pt stop loss. I expect to lose around 20 pts (give and take a couple of points) in options if my SL is trigerred. However my observation is that often i lose close to 40 pts in options as well. What can i attribute this loss to? Most times, SL gets triggered on the same day, so time value impact is minimal…..I am guessing vega plays a role but at all times???? What could i be missing? Prashanth – When underlying moves by one point, the premium is expected to move to the extent of delta. So if the delta is 0.6, then for every one point move in the underlying, premium is expected to move by 0.6 points. I’m elaborating your case here – You buy 7900CE (ATM), premium is 180/-, Delta is 0.5. Spot moves to 7940, 40 points increase..so new premium will be old premium plus delta times movement in the underlying. Hence new premium is 180 + (0.5*40) = 200. However now that spot is at 7940 (slightly ITM) delta is 0.6 (approximate value). While you have a 40 point SL on underlying the premium will react a bit differently. So if market falls by 40 from 7940, then you will lose 40*0.6 = 24 points. So…that would take the new premium to 200 – 24 = 176 points. Besides, as you mentioned, Vega has a massive impact on options premiums. Also I have observed that in bank nifty expiry the value s of CE and PE reach to almost 0.05 ..So if I will put sale order in both cases .So will it work.only in this case zerodha is asking around 50k margin to take one lot…As per observation Almost In the money and at money contract becomes zero on expiry ..So if put sale order in both cases by adding margin to my account..So will this startegy work.. I should Mangesh. I’d suggest you paper trade this for a few weeks before actually implementing this. Nowadays U r taking too much of time (abt 15days),pls reduce the time at least to 1week..
regarding premium calculation 180 + (0.5*40) =220,this is not 220,but 200 and calculation is right 220 – 24 = 196,but as per eg.we should subtracct from 200-20=180. Ah, thanks for pointing this, will look into it. ODIN Diet, when you select paricular stock or strike and click CTRL + pg up, a window pop up with BS calculatore, which have all input information as default ,you just click on calculate and will get all output, hope you also can do that. Karthik,you are a very innovative person and trying to give latest and best trading system to your client, hence request to look in to that system, i am sure you will appreciate. When you will post “Option strategy” in Varsity? any specific timeline? Starting work on next module soon. Very good explanation in a simple way. In MBA i studied Derivatives during my higher education, but it was all theoretical and also difficult to implement in real world. This explnation was really help. But i have some doubts. The historical volatility is a simple “Quick & Dirty” approximation. For Nifty options,what can be the dividend. as per your link nifty ‘s today’s dividend is 1.51 right? For Nifty Premium calculation In BS options, in the Spot (underlying) option whether nifty index value or current month future value to be entered? Does the theta derived in BS clculator denotes the decay of premium per day .Is it so.The varsity article doesn’t mention that. Yes, theta is the decay in premium value attributable to passage of time, provided all else is equal. Let me check this again on Varsity. Thanks. Which module covered Rho ? Not covered Rho, as Rho indicates the change in premium wrt to change in interest rate. Interest rate does not change that often, hence decided to skip this Greek. I am satish srinivasan and I am trading in my sister’s account.Till date I haven’t succeeded in trading and I haven’t asked anybody’s help I don’t know who is the technical person who is supporting traders at zerodha my personal wishes to him.I hope if you lend your hand to me it will be very useful. I hope a conversation with a wise man around a table is as good as reading thousand many books. If you are reading this, I think I am close to you.If I could able to come this far, I think I can come little further.I will keep an eye out for you. I will be hoping that this letter finds you. Satish – not sure with whom you need to speak. We will be more than happy to respond to queries posted here, so please do not hesitate asking questions here. Rho is the rate of change of premium with respect to change in interest rate. sir, i just calculated option Greeks of usd inr and current call option premium is 0.2700 but in option calculator show option premium is 0.1600 is it ok or is there any mistake ? and also in theta put option have no theta please explain !!! Well the option calculator gives you the theoretical option price of an asset based on the factors playing out in the market. It is not necessary that it should match the current market price. Not sure about the Theta, will check and get back. Thanks. In fact you can use ViX values (for Nifty) for both Calls & Puts. Yes, you can use the same ViX values to get the approximate Greek values. 1. In RBI site 91 day T bill is blank, what does it implies? 2. where to find wipro is going to give in feb month or not, to enter dividend on B&S calsulator? You need to enter in a value – the interest rate of the T bill. This is available on the RBI website. Dividend info is available as and when its made available. Oh, in that case you can take the 180 day bill rates. Now suppose spot moves by +25 points and new spot is 365. This is a tricky problem Rohan. In reality the Delta is a continuously evolving variable and it does not stop to change till expiry. For all practical purposes, its best if you define your timeframe and evaluate the deltas at that period. If I enter values in B&S calculator it gives values of delta,gamma etc for both call and put options for given spot ( 1200) and strike (1220). I assume you are talking about the B&S calculator on Zerodha. We’ve put up a very basic version of the calculator. You need to be aware of which option you are calculating for and enter the relevant IV. Thanks for posting this, Gamma of an ATM option invariably shoots up as we approach expiry. However I think this gamma value is extremely high. Let me dig in deeper and get back to you as soon as I can. Thanks. Not sure why, you will have to speak to NSE for this. Interest rates don’t change daily, so that should not worry you much. For stock specific volatility information I’m not sure where we will find it…maybe you will have to calculate it yourself. From my experience, knowing the rough volatility figure is good enough, unless you are dealing with some volatility sensitive trades. For Nifty, I’d suggest you check ViX, that will give you an approximation. 1.How does RBI interest rate effect options? Can you share some details on it? 2.How to find dividend for stock rather than Index as you have posted in earlier reply. The effect of interest rates are captured by a Greek called Rho, I skipped discussing this as Interest Rates dont change frequently. In general interest rate and options premium have an inverse relationship. You will have to keep track of corporate events for info on dividends, bonus, splits etc. Can you refer any site where I can track of corporate events for dividends, bonus, splits etc of each stock in NSE/BSE? I have searched in many but didn’t get any appropriate result. thank you. I searched in money control but didn’t get at that time. In the NSE option chain, the Interest rate considered is 10% (Note at the bottom). Why is it different from RBI [91 day T Bill] Interest Rate? Isn’t it appropriate to consider the interest rate mentioned in NSE, because that is the basis we pay as premium ultimately while trade? Also do we have to separately calculate the Daily Volatility, although it is mentioned in NSE Quote Page? Can we take the same value while calculating the premium (for Options) or stop-loss (for Futures) – I understand that knowing how to calculate is a better to understand the concept as covered in Chapter 7. Ah! I never noticed the interest rate bit in the option chain. Thanks for pointing that out. Not sure why NSE assumes 10%, it does not make sense to me. Also, there is no harm taking the values from NSE…although its good to know how to crunch the number! Well, Thanks to you for such wonderful modules and in-depth explanation! 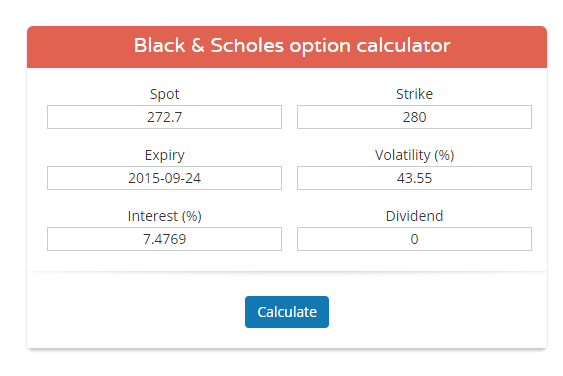 I tried to calculate the premium and Greeks based on the description in the module, using Zerodha Black & Scholes Options calculator, but it was not matching the NSE option chain. When we put the values of Interest rate and volatility as per NSE website, the figures mostly match. Yes, we have taken the interest rates as per the t-bill rates. When we put all data in Black & Scholes calculator we get the present premium of the stock/index. But how to calculate the future premiums. For example; shorting Nifty 8800 CE at 62/-. If Nifty rises to 9000 what will be the premium. How to calculate. You can do that using the Delta, this will give you an approximate value. While going thro NSE website to read volatality of Bata, nothing is mentioned in the column. In that case what fig. need to be put in Black Scholes formula. Yes, if you are referring to the Implied volatility. If you are talking about historical volatility, I’d suggest you use the the ‘=STDEV’ function in excel. Karthik, firstly thankyou for the great explanation. and i have a small doubt, in the above video there is only B&S call option formula THEN what is the formula for B&S put option ? The calculation for Put option is quite similar Rakesh. actually my doubt is , in the B&S formula should i input IV which is shown in options chain(IS THAT IMPLIED VOLATILITY NOT VEGA )? how is that IV calculated for different strikes? is it same as theSD calculation? Hi Karthik, can we calculate the IV of a specific strike through using the LTP’s (premiums) of past 1year of that strike and can we find out SD or IV of that particular strike ? (yes or no). correct me if im wrong. IV is more like the volatility at this moment…its kind of forward looking. Moment we look at volatility we are referring the the ‘realized/historical’ volatility. I think it is good, may be little improvisation possible, considering Greeks as well. Great Explaination !!!! thanks alot. 2) When i calculate Option Pricing using BS Calculator with IV of Call option with 10% interest rate and IV Put option with 10% interest rate (different IV for Call and Put from NSE option Chain with 10% interest rate) then Greek values of BS calculator matches with NSE Option chain. But when you put 91 day Tbill interest rate then values doesn’t matches. Why do so? 1) India ViX values are available on NSE, please do take a look at their website. 2) That’s because NSE considers 10% interest rate values. As i am newbee to options ….Pls correct me if i am wrong .After reading all the chapters what i have concluded is the options trading requires all Greek consideration as well as view on the broader market(if trading on the Nifty)/underlying assset. isn’t it? Every chapter is specific to individual greeek and very much clear. When it comes to trading , i couldn’t able implement. Can you list down the mechanical rules while trading options. Ex : If i want to trade only on Nifty index then how to start building trade plan. Doubt: After doing technical analysis,I put the stop loss according to the my spot price .i.e i calculate the stoploss price and see the delta value…and according to that i m trying to use it but failed to do successfully because i am not able to correctly estimate the the combination all the Greek at once.there is any calculator for intraday or positional position to solve my problem..I tried black and scholes calculator and not able to understand how to calculate the target/stopploss using greek value.Please guide me sir…Thanks in advance. Avinash – If you wish to identify SL price, I’d suggest you stick only to technical analysis. As far my experience goes, apart from vega, no other greeks helps you identify sl/entry prices. I have a question on period or duration of Implied Volatility. When we calculate historical volatility, we calculate it for a particular period like – daily or annual or 30 days etc. Does Implied Volatility refer to any particular forward period ? For example, If Implied volatility of Bank Nifty Call Option 24 Nov 2016 is 24% , does it mean market is expecting a volatility of 24% in the index value of for the next year or only till option expiry date ? Yes, it does. If the IV is 24%, then its the market’s volatility expectation (at this very moment) for the next 1 year forward. I was trying to use the option calculator and stumbled upon this strange thing on NSE website while looking at different nifty strikes for Jan 2017. This 8250 PE for Jan series shows a net change of +118 points and 7750 PE shows +44 points but for almost all other strikes the net change was in negative. can you help me understand? Different strikes behave differently for the same movement in the underlying. The option chain summarizes these changes along with other changes. Understanding option chain requires you to have some background in options. I’d suggest you start from chapter 1. Thanks Karthik, your teachings changed our approach to the trades with conviction. Yes, since the spot is at 98, 95CE is ITM and the delta is likely to be 0.7 or higher. Not sure why the calculator is not reflecting this value. Can you please check again? Yeah, I guess it is because of the date selection. Not sure, you will have to adopt one of the models which will help you calculate the same. sir i wanna ask you is this future value for premium or current fair valye which should be???? It is the fair value of the premium for the give strike and spot value. What’s the formula to calculate the call and put options Gamma, Theta & Vega using excel. I’ve not gotten into the formula as it can deep dive into quants. But just to give you a direction – the formula is a 2nd order differentiation of Black & Scholes formula. But it is giving different premium values. Here are the screen shots. Please have a look. It is giving some different values. Please let me know what mistake i am making. Not sure why the difference, but I’d like to believe our calculator is accurate. means input values are correct? also i wanted to know that IV will be according to call and put? right? IV should be same for both call and put for the given strike. However, you may notice some difference here. what are all the ways to find ( PCR is steadily rising and declining)? I am still in the process of learning. Can you please tell me how many days before Ex-Dividend date I need to buy the stock and keep so that I can enjoy the dividend. Is this possible or else do I need to keep it for 1 complete year so that I get the dividend. I am confused. Also I see that there is lot of buying and selling happening when the Ex-Dividend date is nearby and on that day. Can you please brief on this please. How can I calculate option pricing for strike price of 350 in option chain image of ICICIBANK above since IV is not given? The call and put delta calculated for ICICIBank ATM 280 strikes in the picture is 0.127 and -0.873 respectively. Aren’t these values for Deep OTM CE and Deep ITM PE. Also I notice that: Delta (CE) + Delta (PE) = 1 in this case. Does this mathematically hold true everytime? PS: Thank You for the modules. This has indeed helped me and others to gain a much deeper understanding of the Financial Markets. Yes, by virtue of delta it is deep OTM and ITM. Does this mean, an option can be classified to have a different moneyness than its actual based on the greeks. And at same time, it can be classified as different moneyness by different greeks at the same moment in time (because the interactions is hanging everything dynamically every second)? If yes, then what should we consider for a strategy (I haven’t read the option strategies module yet, maybe that will shed some light on this). For a delta neutral strategy, I guess we would consider just the deltas. But this is a wide variation if an ATM option is classified as Deep ITM/OTM. And it may soon change its delta. But say I want to build a strategy myself, what should matter most for a classification? WHICH SHOULD BE TAKEN AS SPOT VALUE in calculator for bank nifty.Underlying or future value? It seems there is a difference between the values(from option calculator and actual market value? )…why sir? The difference is expected. This can be attributable to the market inefficiencies. If you feel the difference is too high then you could sell the option, otherwise, buy….in both case hoping it would align to fair value. Hey! About the dividend, if it’s within the period, then we write the value (in percentage terms I believe? ), if not, we leave it as zero? 1. Why so much difference in premium? 2. What would be the expected move for nifty in coming days in such situation? 3. How would you trade in this type of situation? 4. Is it wise to buy a ATM put as the premium is low? 3) Assuming my volatility input is correct and the markets are pricing the options wrongly, I’d buy both the options as they are cheaper compared to their respective fair price. 4) Yes, for reason stated above. If your pricing is correct, then you can make profitable trades as the market price will eventually catch up with the fair price. Anyway, I’m not sure if Nifty ATM puts can trade with such a large discount to fair price. Check today, I’m assuming the prices have corrected. Please don’t mind, me asking silly questions. First of all thank you karthik sir. I learned alot with Zerodha varsity. I tried to calculate Option premium by using zerodha B&S option premium pricing formula for Nifty as on 08.12.2017 closing time. the details are as below. it seems to be there is vast difference between actual premium and the theoretical premium calculated. Kindly explain me where did i got wrong and correct me. The dividend for Nifty 50 is 1.11 from NSE website. B&S fromula in Zerodha website not taking decimals. i tried with 1, 2, 3 so on. whatever the value of dividend the premium is not changing. CALL OPTION PREMIUM for 10400 Strike is – 49.41 but The actual LTP premium price is 37.20. Well, in that case, I think there is mispricing. Market partici[ants will correct this sooner or later. the calculated premium is 27.57 where as actual LTP premium is 27.60. this is matching perfectly. i have calculated premium for reliance 960 strike using volatility from option chain and futures contract. in this case the IV selected from option chain is giving better result. my understanding is that volatility of future contract for nifty is giving better result whereas for stock IV of option chain is giving better result. Kindly clarify which volatility have to be chosen. You need to considered the implied volatility of the option for calculating the option’s premium. However, you’ve made an interesting point of futures volatility. Let me check if this can be taken as a substitute. I have made position for Nifty 10600CE on 14.12.2017 (Nifty Spot is 10252) during closing hours of market at a premium of 25.62 in anticipation of market opens gap-up on the back of positive gujrat exit polls which will be announced later in the evening. Later in the day all the Exit polls predicted BJP majority. Market Today as expected opened gap-up 94 points but not made any follow through. The premium for my position opened at 35.6 and dropped to 27 after 30 minutes of market opening, but the underlying Nifty fell only 20 points. My question is why premium fell suddenly when underlying not fell substantially. This is because the volatility dropped the next day and with that the premiums also did. It could be really better if we can view the Greeks in the ‘Positions Table’ in Kite..! Hope you will work on this..! Noted. Will pass the feedback, Rajesh. 1.B&S options calculator is used to know the Greeks values for that strike as per the spot how the premium calculated based on the volatility? Is B&S options calculator used for test cases? How can figure out if options are over or under-valued and if volatility itself is under or over-estimated. 1) Not too clear with this – can you please rephrase it? 3) Not necessarily, the market can misprice the option leading to the difference in price. So I should not buy the options??? Because they are expensive. Ankit, the value obtained from the calculator is a theoretical value, whereas the value seen in the market is reflective of the sentiment prevailing in the market. If the difference is beyond an acceptable value then it does not make sense to buy…rather you can opt to sell them and collect the premium. Ankit, if the RBI Reference rate is 64.54, then the intrinsic value of 63.75PE is 0. So the entire premium of 0.3675 is attributable to the time value. Such high time value is justified since you’ve bought the Feb contract, which will expire only next month. Intrinsic value is a non-negative number or 0. It is Strike – RBI Ref, but if it is -ve number, then the IV is considered 0, hence the rest becomes attributable to the time value. Thanks but I am sorry RBI reference rate was 63.54 not 64.54. Yes, that makes sense now. Good luck with the trade and remember, the intrinsic value of an option is always a non-negative number or 0. Karthik, i see for some of the strike priices the IV is 0 then, i am getting the call premium as 0. pls advice. This is because the option has no trading volume, no liquidity. By seeing chart without indicator people calculate target SL etc. in stocks. How about option trading without Greeks, expert people calculate the approximate premium ? or Greeks is required only or with experience it will come ? Delta, helps you identify the premium to some extent but that apart, you can gauge this in the backdrop of your experience. Demand and supply role ? in option premium say ATM option people are doing more trading that means more demand so price will increase, how it differ from voltality ? Volatility dictates the extent by which the premium varies, demand supply does not. Seems in the BS calculator AV input of over 100 is not seen captured in the provided model.Could you pls check? Let me check this, I’m dont think this is hard coded. Anyway, well see. Thanks. Testing checked for R com 50 CE current month expiry for an IV of 107.34.No output available.Till a volatility of 100 it is ok.
An applied DV of 5.25 can take AV to over 100 and it is not that extreme Karthik.Its only that its not visible because of lack of liquidity in options and traded price is looked into rather than the settlement price.In a sort Black swans are happening in individual scrips during random walks at many instances on a daily basis.May seem gibberish in economic thoughts but when I tested it seems a fact. Very interesting. I do get your point on lack of liquidity and the isolated black swan events. I’m just curious to know, we calculate our profits based on an assumed Delta value for a given option premium based on whether the strike price of the chosen option is either Deep ITM (Delta – 0.75 to 1), ITM (Delta – 0.5 to 0.75), ATM (Delta – 0.5), OTM (Delta 0.3 to 0.5) or Deep OTM (Delta 0 to 0.3). Obviously the spot price keeps changing during the open market and I’m assuming that the Delta of any given option MUST also change based on which category (Deep ITM, ITM, ATM, OTM and Deep OTM) it falls under, as the spot price fluctuates. Is my assumption true? If Yes, how often is the Delta for any given option recalculated. If Not, are the Delta’s of every option fixed throughout the day and decided at the opening price of the contract value? I would really appreciate your answer to this question. Seems NSE uses overnight MIBOR rates for risk-free interest calculation .Cant understand the logic why NSE uses 10 percent for IV calculations as showed in the note below option chain. Not sure, Najeeb. By the way, do you have a link which says NSE uses MIBOR? Can you please share? Thanks. you may try this one too. I understand that prices are governed by market dynamics but, today I saw 10800 Option closing at Rs2.5 but, BS calculator shows this value as 0.32 (Interest rate 10% + IV 12.85) which is almost 10 times less than the theoretical value – this seems bit too much of a deviation – in your experience is this normal? Are you sure you’ve used the right volatility input? Wrong IV inputs can lead to big changes in the premium. 1) BS is used for getting both Call & Put option premium but, in Nifty option chain the IVs for put and call (for same strike) are different – Different IVs I do understand the rationality but, then shouldn’t the BS have different inputs of Volatility for calculating premium / Greeks of Put and Call option in this case? 3) At what time on the expiry day Options stops trading. I am asking this because today (31/05) as you must be aware Nifty went to 10763 around 3:08PM and I had shorted 10750 CE but still the option price was 1.05. Shouldn’t it have shot up to somewhere around 13Rs? Had the market closed more than 10750 making 10750 CE ITM would the difference have been deducted from my account when the contract was being finalized? – Also, Noted that around the closing 3:25PM the market went beyond 10750 for sometime – in this case should we square off the position or just let it expire because premium price was stuck at 0.05 at this time. Hope my questions makes sense. 1) Technically speaking, the IV of both CE & PE should be the same for a given strike. But you won’t see this in the market as each strike has its own demand-supply situation, impacting the IVs. The procedure for calculating the greeks and premium for CE and PE is the same, which is what the B&S calculator does. You need to enter the relevant IVs to get the appropriate figures. 3) It trades till 3:30 PM. Maybe there was no liquidity in the contract? Also, say market had closed at 10760 then I would have suffered a loss of 10 Rs (as I wrote 10750 CE) and money would have been deducted from my account – Is my understanding correct? Yes, this is right, you’d have a loss of 10 bucks. I’ve heard of IV Rank and IV Percentile. Can you please explain them with examples? How to use them while trading options? The concept is similar to Vol skew, will try and make a post on this soon. Thanks. suppose canara Bnk in running at 255 today and i want to test the 280 CE rate with the help of B&S calculator. at this position which IV have to input , ATM Strike price input or my selected Strike (i.e – 280 CE) IV input? please clear the doubt. Yes, Khurshid, you can actually input the ATM strike IV. The result is 70.66 Call option premium on BS. How to interpret this? Intrinsic value is 70.6 and traded at 88.5? Ok so what now? This means the market is valuing the option more than its theoretical value. I would like to know suppose if call option is 34 and theta is -4 at the starting of the day at around 9.30 am…If all the Greeks and price remain the same at market closing at around 3.30 pm option premium will be reduced by theta value of -4 and premium will become 30 or on next day opening it will reduce by -4…theta is calculated on hourly basis or daily basis? Theta is on a daily basis, so all else equal, the next day morning the option will open at 30.
does theta decay value shown in b&s calculator also considers non trading days that is saturday and sunday while giving its input. for example at friday the theta of option is 0.5 and its preimium is 5 .Then all else equal will it open by monday at 3.5 or at 4.5. I tried zerodha B&S calculator model for maruti 10000CE aug expiry it shows option price18.68 but as of now it is trading at price 24.55 can you tell me why the difference. I have taken following inputs. I think the volatility is much higher. Also, if the difference can be attributable to the difference in demand and supply. The current page https://zerodha.com/tools/black-scholes/ gives us a way to calculate the premium as seen currently. Is there a tool by zerodha to know the premium with time as future datetime as additional input along with spot price, volatility? If not zerodha tool, can we do the same in excel? I’m not sure if this is possible. But however, one way to do this is to reduce the time to expiry to your target date. Oh right! Thanks for the hack., just didn’t think of it. So as per the example i gave, when i want to know the expected premium of option on Nov 20, all i should do is calculate the number of trading sessions from Nov 20 to expiry date, let’s say N days. And input the expiry date is calculator as (Todays date+N trading sessions), which should give me the premium. Am i right? Just one last help the above calculator. It doesn’t work when the IV is beyond 100 (works for 100 though). I wanted to calculate the premium of option PCJEWELLER18NOV75, where it’s IV is 101.43 as of now, it doesn’t give any output. Thats right, Vishal. Reduce the number of trading days and you will know what the fair price of the option on that day. I think IV has an upper limit at 100…will double check. Thanks. Looking at Greek values, Can we build any strategy for Option buying and selling, any inputs what delta/gamma/theta/vega should be to buy or sell Options. Do we need to use RBI interest rate for other stocks as well like Infosys, TCS, Tata Motors etc or it is only for banking stocks. Should I use interest rate from RBI for non banking stock as well like Infosys, TCS etc. Getting back to you again!! I have tried finding the exact formula for B&S in many sites, got few also however I am not getting the output of those when I do the calculation in my Excel and compare it with the Zerodha Calculator. I am hence requesting you, if possible can the formulas of B&S or some sample excel sheet be shared please? I am just working out on things in practicality and trying to find my own answers to them. Please help. 1) If I go to the NSE Site and Let’s Assume I select “WIPRO” then go to the Options Chain.. Then I see many IV’s marked as “-“. Can you tell me what do we consider in those cases where the value of IV is “-” for the Greek calculation? 2) May be very lame question, please pardon my ignorance. In an Option Chain, If I go DEEP ITM for CALL OPTIONS where I see that there is a Bid and Ask Quantity, I dont see and LTP value. How do I buy those Options if I want to buy them? 3) I understood that we BUY CALL Options when we have a Bullish outlook of the underlying. The Current Spot Price of WIPRO is 351, Ideally I should be buying values are ATM or OTM right? Like 355 or 375? So in case the price goes beyond 355 or 375 then I make profit of the difference. Is my understanding correct? If I go the F&O calculator of Zerodha and put the strike price as 375 and BUY for CALL Options, I dont get any Margin details. However If I select SELL then I get the Margin details. I may be making some blunder mistakes in terms of my understanding and hence I am getting confused. Please help. BTW How do I attache the screenshots? 2) Unfortunately, the liquidity in most of the deep OTM/ATM options is quite shallow. LTP shows up only when a trade occurs, in the absence of which there is no LTP. To buy an option you dont need margins, you need only the premium about. To sell an option, you need margins. Upload the screenshots on google drive and share the link. Good luck, Suvajit. Keep going! So far from the module I believe that have understood theoretically, however when I am trying to implement these into practice, I am finding it difficult. I need your help in understanding B&S. Spot value of NIFTY is at 10661.55 and strike consideration in 10800 CE Jan 31st expire. Current option premium Rs. 32.05/-. Please find below B&S output. 1. I have got the output based on the inputs that have giving. 2. I understand Delta value helps in increasing/decreasing the premium based on the directional movement of the underlying for both PUT & Call option, where I have got value as 0.202 for call option and -0.798 for put option. As a seller of call option I have 80% chance that the strike price will expire worthless. 3. Gamma tells us that the delta will increase by 0.0018 based on the movement of the underlying. Would like to know, like delta has range between 0 to 1 and -1 to 0, does Gamma also have any range. 5. Vega: Based on the volatility movement the pricing of the option premium will either reduce or increase. 6. Please correct me on this – Since I see that the value of call option Theta is comparitively more that call option delta & Vega, it is obvious that there is time decay and the option premium will go down by the expiry, however how far is this true, because the same doesn’t work with the put option considering it is ITM. By the question that i have framed anybody can easily understand that I am confused or did not understand the concept. Please help. What is Implied Volatility and how it effects our option trading, If you mention in our varsity please let us know the link. I have tried to see but i did not find it. My apologies If I am in any way offending you by calling you Sir but I must call you Sir as I have really loved, learned a lot from your super write-ups. Thank you once again. After a really long month of Study and working in parallel. I have built a Trading System of my own using Google Sheet. I can do some pattern analysis, Indicator Movements, Potential Hedging, Options Greeks Calculation and few other factors. I have built a system to BackTest my results also for any period I would want to check. However all these things that I currently did is using Historical Data, So my Google Sheet can only generate a Trade Call after the closing of the market .i.e. around 8PM when today’s data will be available, then I will have to BUY/SELL that script tomorrow first thing in the morning. 1) Can I get real time data in my excel or google sheets? Any API or any suggestion how I can get some real time data? 3) A combination of candlestick patterns which gives a BackTest (360 days) of almost 90-95% Success. Can we just blindly trust those calls further? 4) I am planning to start trading Options (1st) and Future (2nd) going forward. 5) Can you suggest some other books or readings which can help me further enhance my strategies? I have burnt my fingers in the past and have lost very huge amount in the market and that’s why this time with your help I am working hard before I jump in the fire. Note: I have not done any trades yet using my System generated calls yet. Any suggestions or help please. 5) I’d suggest you read more on risk and money management techniques, maybe you should check with the Varsity module itself. One quick thing, I am not a coder and so can I get some help on how to use those API’s to accomplish my tasks? Any documents or any step by step guide? Yeah at the beginning the BackTest result was around 60-65% and then I did a lot of fine tuning and now in few cases I get even 100% success results. May be if I increase the timeframe to 720 days the results may come down. I will let you know as I try with 720 days tomorrow. The link I provided you has all the technical documentation you’d need. Unfortunately, I’m not a coder either so very little help from here on this count.